At the turn of the century, Brillion, WI-based Ariens Co. began practicing the principles of lean manufacturing, and it’s been an important part of daily life at the company ever since. So when Ariens began experiencing problems with its robotic-welding cells, management quickly went in search of a solution to ensure that productivity remained high, while the reins remained tight on downtime and service calls. Thanks in no small part to relief robotic-welding cells taking the place of aging and unreliable cells, Ariens continues to churn out snow blowers and other outdoor power equipment at a great clip. In fact, the company recently announced plans for a $9-million upgrade and 45,000-sq.-ft. expansion of its product-development center in Brillion, WI, slated for completion by the fall of 2018. 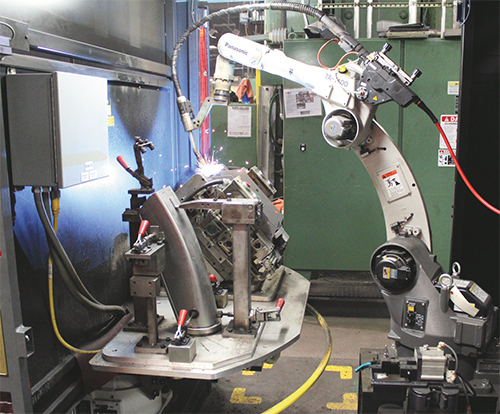 Ariens has long used robotic welding on the manufacturing floor, but in recent years its aging robotic-welding cells became plagued with breakdowns and downtime for service. Its robotic tech-support department averaged more than 5000 tech calls for robotic weld-cell breakdowns annually, with each call averaging 13 min. “When some of the older cells crashed, they were down for hours,” says Ariens team leader Ron Heiting. The company also experienced issues with the availability of service, support and parts for maintenance and repair. In search of a solution, Ariens sent several employees to visit with robotic-equipment manufacturers, bringing with them sample parts and fixturing. In the end, the firm elected to invest in new PerformArc robotic-welding cells from Miller Electric Mfg. Co.—five PerformArc 350 systems and one Perform-Arc 750. The 350 boasts a compact 7- by 14-ft. footprint and features a two-station turntable positioner with 350-lb. payload capacity per side. The standard cell also features, in addition to a Panasonic arc-welding robot, an inverter-based welding power supply, a four-drive-roll wire feeder, and a Tregaskiss 500-A air-cooled welding torch. Similar in design, the PerformArc 750 boasts a 10- by 17-ft. footprint to offer a larger work area for welding larger assemblies, using a turntable positioner with 725-lb. payload per side. In fact, Miller notes that the larger footprint allows a second robot to be added to the cell, if needed, to boost throughput. Each of Ariens’ new PerformArc robotic-welding cells features a two-station turntable positioner, a Panasonic arc-welding robot (6-kg payload capacity), a Miller Electric inverter-based welding power supply and four-drive-roll wire feeder, and a Tregaskiss 500-A air-cooled welding torch. 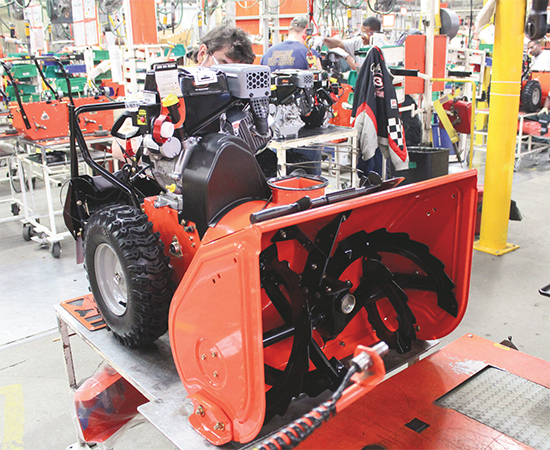 Ariens worked with Miller to customize the systems for its specific needs, programming the systems with the logic layout that Ariens had been using throughout its plants. Miller also integrated the inputs and outputs for the Ariens fixtures, and upgraded the wiring and location of some switches on the cells. During weld-cell changeover, Ariens and Miller technicians worked in concert to ensure that production didn’t skip a beat. Heiting also expresses appreciation for how quickly operators can reset the robots in the event of an error recovery. Included with its new welding cells is the ability to program the robots offline, which allows programmers to test welding routines virtually and ensure that fixtures will work from the start, without having to make changes on the fly. In addition to boosting productivity, Ariens’ new robotic-weld cells have reduced or eliminated incidences of weld spatter, missing welds and short welds. “Our older robots, some of which had 80,000-plus hr. on them,” Lutterman says, “had begun to miss some welds. We also were experiencing unacceptable amounts of weld spatter and porosity. The noticeable improvement in quality means a much cleaner product, which results in less time and money spent on rework.